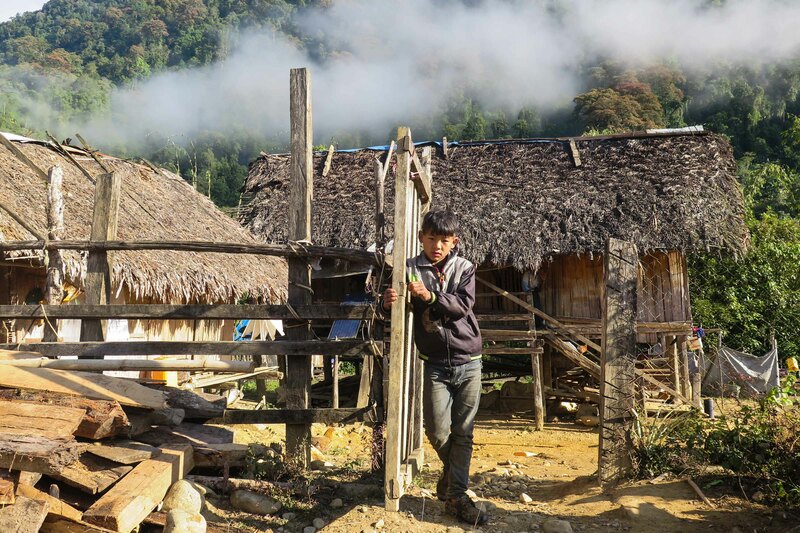 PUTAO, Kachin State — At least twice a year, the people of an ethnic tribe living at the foot of a snow-capped mountain in Burma’s Himalayan foothills travel hundreds of miles through dense forests, mountains, and cliff paths to trade for basic foodstuffs. “We had to sleep around 11 nights on our way to Putao. 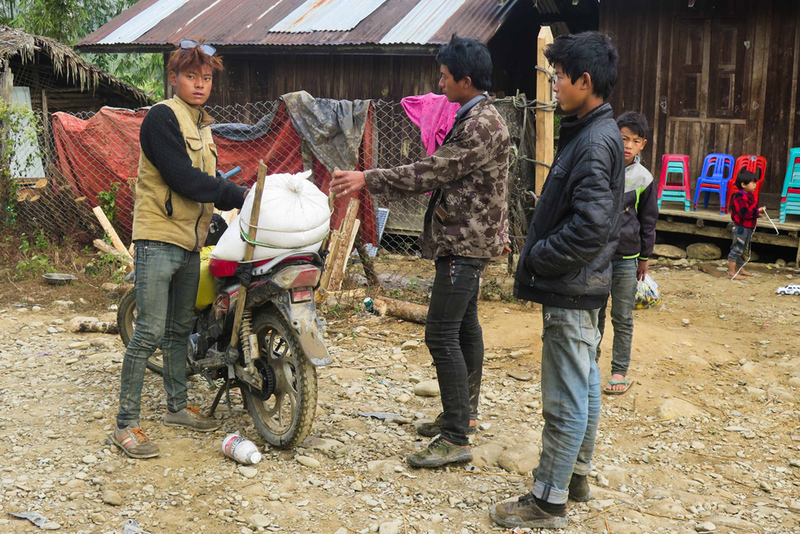 We came on foot for eight days, and we hired motorbike taxis for the rest,” said Chuinn, an 18-year-old girl from Ma Dain village, which is situated at the foot of Mount Lei Fu in Kachin State. Lei Fu is contiguous with Mount Hkakabo Razi, which is believed to be the highest peak in Southeast Asia. Both mountains are part of an outlying subrange of the Greater Himalayas near the border tri-point of Burma, India, and China. It has become an ancestral ritual for Ma Dain villagers to travel hundreds of miles to trade herbs and hunted animals for other foods. Chuinn and 20 other villagers traveled more than 200 miles to reach Putao this year. Both of her cheeks were flaming red because of the freezing cold weather, with the temperature dropping to -14 degrees Celsius (7 degrees Fahrenheit) during the evenings and early mornings. “We came to Putao to buy rice,” said Chuinn. Her village is located in Nawngmun Township, the northernmost township of Kachin State. The villagers belong to the Dalaung tribe, a subset of Kachin State’s Rawang ethnic group, and they carry the national ID cards of Burmese citizens. But the villagers do not consider themselves part of the larger Kachin ethnic group. Although most Kachin ethnic tribes practice Christianity, these Dalaung people follow the Buddhism of their Tibetan ancestors. Yingzin Dauji remembers that his ancestors followed the Dalai Lama, and the Dalaung have passed down Tibetan folk tales until today. Ma Dain is not the only village at the foot of Mount Lei Fu; there is also a neighboring Dalaung village called Dha Hoon Dan. 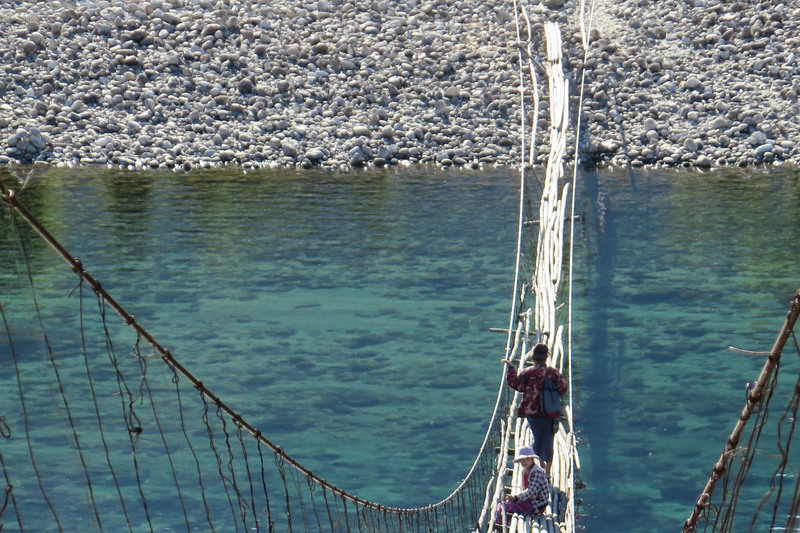 Combined, the two villages have a population of more than 200 Tibetan-speaking people. Villagers also speak the Rawang language, and some are conversant in Burmese. Because of the cold climate and poor soil, villagers cannot grow rice in Ma Dain. Instead, they grow wheat and corn. When they want to buy rice and other basic foodstuffs, the Dalaung villagers must travel the long route to Putao. On the way, they pass through several villages, forested rocky hills, and narrow cliff paths. And they have to be careful of the danger of snakes, said Yingzin Dauji. 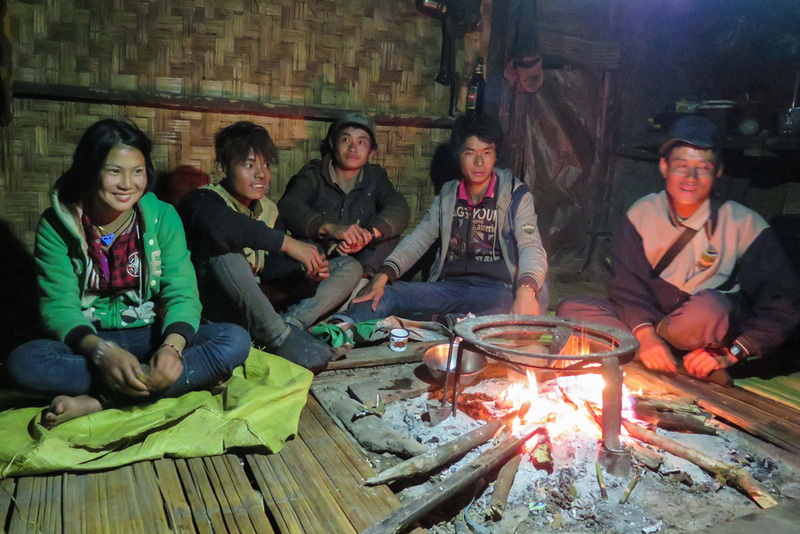 During their journey, the Dalaung sleep in local village homes or in the forest. After nine days of travel on foot, the traders finally reached Zein Sam village, which has access to motorbikes. In Zein Sam, they hired motorbike taxis and proceeded to Putao. 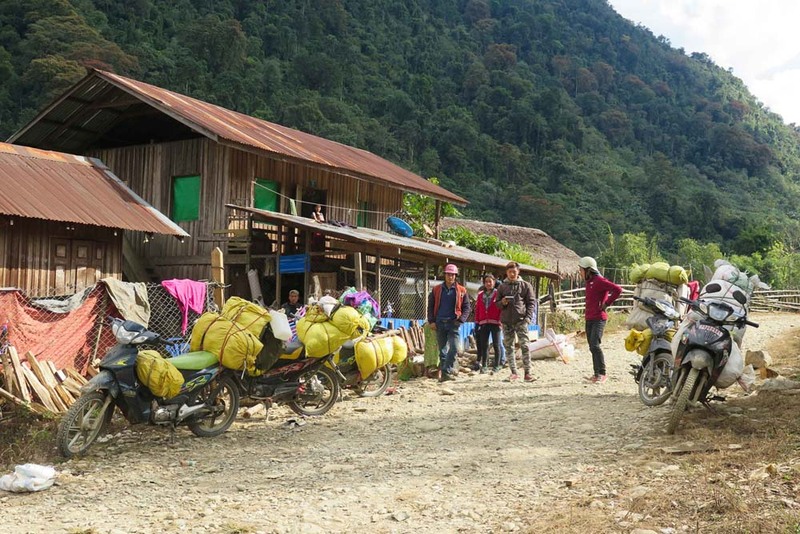 The villages and sub-townships between Zein Sam and Putao sell basic foodstuffs and household goods, but their prices are exorbitantly high, so the Dalaung tribal people prefer to buy their goods in Putao. Typically, the tribal people purchase staples of rice, oil, and salt. One package of salt, for example, usually sells for 100 kyats (US$.07) in the Putao market, but the same package is priced about 10 times higher in the villages of Nawngmun Township. Local grocery store owners said they weren’t earning big profits when you consider their transportation charges. The prices of foodstuffs in Putao are lower than in Nawngmun—but they are still quite high when compared to the rest of the country. Putao food prices can be double the prices of goods sold in major cities like Rangoon. Women also have to carry their share of the burden on the way back from Putao to their home villages. The Dalaung have to be more careful on the return journey because they carry foodstuffs for their families. The major sources of livelihood for Dalaung tribal people are hunting and gathering herbal plants. They hunt fish, mountain goat, bear, deer, barking deer, and musk deer for meat and to sell to Chinese buyers. Typically, the Dalaung tribes will travel to Putao at least twice per year to buy foodstuffs. The rest of the year, they devote their time to searching for herbal plants that they can sell in the Putao market. Chinese buyers often come to purchase herbal plants at good prices. This is the life of Dalaung tribal people. They search for herbal plants, go to Putao to buy and sell, and then return to their village to repeat the cycle. Year after year, they have lived this way—a very simple life. However, this pattern may be slowly changing. Some Dalaung parents have started to send their children to schools in Putao. Yingzin Dauji has sent his son to Putao, where he studies in the ninth grade. The parents want their children to be literate, and some want their children to find jobs in the bigger town. Some want their children to not live the same traditional Dalaung lifestyle. La Da, a 25-year-old resident of Dha Hoon Dan village, said there were some Dalaung people working now in Rangoon.